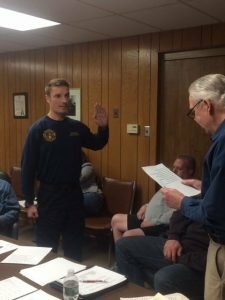 Chairman Fred Jones, Jr. of the Westfield Fire District announced that Firefighter Scott Kotowski was sworn in as the new Deputy Fire Marshal on Tuesday, May 9th at the monthly Commission meeting. Kotowski completed the five months of school to learn code enforcement, fire and arson investigation and public fire safety education. He received his certification from the State Fire Marshal’s Office and the District was pleased to appoint him to the position of Deputy Fire Marshal.